Background: The aim of the study was to investigate the metabolic activity of aneurysms of the main arteries. It has been done in retrospective analysis of routine oncological 18FDG PET-CT.
Materials and Methods: In our material (2 925 FDG PET/CT studies), aneurysms were found in 26 patients (8 F/18 M), 5 of whom had inflammatory aneurysms. 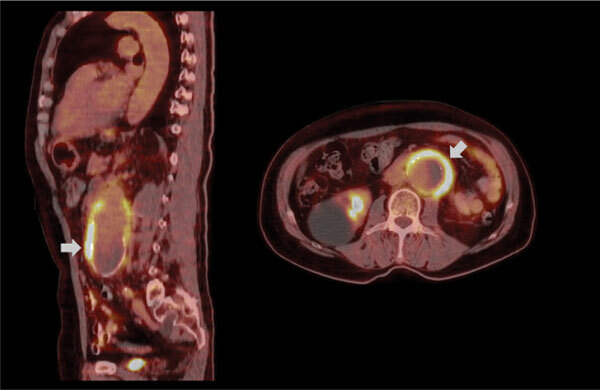 The diameter of the aneurysm was measured at its widest point, while the metabolic activity was determined by SUV max. No significant correlation between the size of the aneurysm and its activity was found. Results: When comparing inflammatory aneurysms to non-inflamed ones no significant differences in maximum size were found. Conclusion: However, notable differences in maximum activity were observed (p <0.01). There were no relation between the size and metabolic activity of aneurysms. Positron emission tomography, fluoro-deoxy-D-glucose, aortic aneurysms, arteries, metabolic activity, inflammatory aneurysms.